Environmental Site Assessments (ESA) are often conducted on behalf of banks, real estate companies, finance companies, insurance companies, and public institutions and agencies. Institutions with financial responsibility, such as banks, lenders, or financiers want to ensure they do not buy a property that could become listed on a state superfund list, or require costly remediation in the future. Landowners such as private companies and public institutions want to ensure that any property they acquire is either free of contamination or that the cost to remediate the contamination can be factored into the selling price. A good Phase I report should follow ASTM 1527-13 Standards and be written to provide the client with as much relevant information as possible in a format that is concise and easy to read. Executive Summary: Summarizes potential environmental concerns identified on a subject property or adjacent/near properties. Introduction: Contains general information on the Purpose, Methodology, and Scope of Services for the Phase I ESA, as well as who granted authorization and access, Definition of the Subject Property Boundaries, the Warranty, and the Limitations of the Phase I ESA. Subject Property Description: Describes the Location, Immediate Boundaries, Dimensions, Function, Zoning, Improvements, Utilities, Topography, and Drainage Patterns, Geology, and Soil Characteristics of a Subject Property. Adjacent/Near Properties Description: Describes the land use of properties immediately adjacent to and near the Subject Property to a distance which potential environmental concerns on those properties will no longer represent a concern to the subject property. Historical Research: Includes the review of historical information sources such as topographic maps, aerial photography, city directories, fire insurance maps, and chain-of-title summaries in an effort to determine all past land uses of a subject property and adjacent properties. Regulatory Agencies: Lists the reviewed regulatory agency databases and summarizes the sites that are potential environmental concerns to the subject property. Interviews: Presents information on a Subject Property or adjacent properties as disclosed through persons knowledgeable about those properties, as well as other information including radon gas concentrations and wetlands status. Potential Environmental Concerns: Summarizes the available information on potential environmental concerns identified on a subject property or adjacent/near properties. Recommendations: Presents significant environmental concerns associated with a Subject Property or adjacent/near properties and recommends what steps should be taken to address those concerns. Appendices: Includes copies of reproducible information sources reviewed during the Phase I ESA, as well as an area vicinity map and a site diagram detailing any potential environmental concerns. The EPA All Appropriate Inquiry Rule. The revised ASTM 1527-13 Standards. The Phase II ESA is conducted when a Phase I ESA identifies Recognized Environmental Conditions and further investigation is recommended. The purpose of a Phase II ESA is to determine whether Recognized Environmental Conditions are present in environmental media at a property. Soil testing and groundwater testing is often conducted to determine any contamination areas. 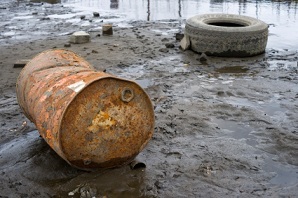 Chemical testing is performed on the environmental media samples that are collected from the site. If Recognized Environmental Conditions are present, the environmental consultant will recommend remediation in the areas of concern. A Phase II ESA is to be performed in accordance with ASTM E1903-11. Have Questions About Soil and Groundwater Contamination? Call SRP Today to Schedule an Environmental Site Assessment. SRP has eight convenient locations throughout California, Colorado, Hawaii, Louisiana, North Carolina, Texas, and Pennsylvania.